America’s population is aging: by 2050, the number of people over the age of 65 will double to 83.7 million (from 43.1 million in 2012). And while the public perception of lesbian, gay, bisexual, and transgender (LGBT) people is largely one of a young community, there are actually more than 2.7 million LGBT adults ages 50 or older living in communities across the country. Many LGBT older adults are bisexual. A Closer Look: Bisexual Older Adults takes a closer look at bisexual older adults: who they are, their unique disparities and resilience, and recommendations for competently serving the community of bisexual older adults. Mounting data points to a clear picture of the lives of bisexual older adults: social isolation and invisibility, economic insecurity, and poorer health. Both the LGBT community and the aging network can and should do more to ensure that bisexual older adults feel welcome both in LGBT spaces and in the aging network’s provision of critical services and supports. Movement Advancement Project. September 2017. A Closer Look: Bisexual Older Adults. 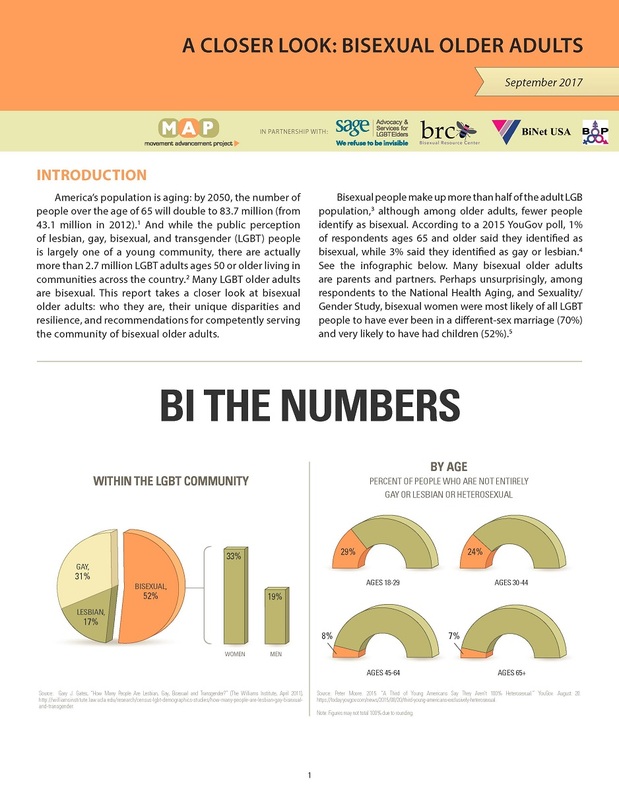 http://www.lgbtmap.org/bisexual-older-adults (date of access).